"UT/TT Poll: How Texas voters rank the state Legislature’s priorities" was first published by The Texas Tribune, a nonprofit, nonpartisan media organization that informs Texans — and engages with them — about public policy, politics, government and statewide issues. Before they cut programs or services, lawmakers should dip into the state’s savings account, according to a plurality of Texans in the latest University of Texas/Texas Tribune Poll. The economic stabilization fund — better known as the Rainy Day Fund — has a balance of about $10 billion and is expected to grow by almost 20 percent over the next two years. Legislators have been slow to draw from that account, but if they’re faced with budget cuts, 43 percent of Texans think they should get into the fund, while 31 think they should not. Democrats feel strongly about it; 57 percent would hit savings, a position taken by 37 percent of non-Tea Party Republicans and only 30 percent of those who identify with the Tea Party. In contrast, 59 percent of the Tea Party Texans would leave that rainy day money alone, a position shared by 33 percent of Republicans and 19 percent of Democrats. Put another way, a majority of Democrats and a plurality of Republicans would use the fund to avoid budget cuts; a majority of the Tea Party identifiers would not. "They’re interested in cutting," said Jim Henson, co-director of the poll and head of the Texas Politics Project at the University of Texas at Austin. "If you give them something of a rationale for getting into the kitty for making ends meet, they don’t leap at it — but they don’t rule it out, either." The Tea Party movement still has some clout: 21 percent of Texans said it has about the right amount of influence, 22 percent said it has too little and 31 percent said it has too much. Lowering property taxes was the overall top choice on a list of possible legislative priorities in the poll, getting 20 percent of all respondents and ranking first with Republicans and third with Democrats. Holding the line on spending and taxes was the second-ranking choice among Republicans, while Democrats’ top two — redesigning the state’s school funding system and spending more on child protective services — each were top choices for 23 percent of Democrats. Border security split the parties: 19 percent of Republicans said it was their top priority on the list, while only 4 percent of Democrats agreed. Later in the survey, Texans were asked how the state should respond to forecasts that it will have less money available over the next two years. Half of them said the state should make targeted cuts to specific programs and agencies. The rest of the answers were scattered, with 20 percent saying lawmakers should make across-the-board cuts to all state agencies and programs, 17 percent saying they should create new sources of revenue such as fees and taxes and 12 percent saying they should raise existing fees and taxes. Pollsters asked about the state government overturning local laws and got two results, depending on who put the local laws in place. A plurality of 39 percent disapprove of the Legislature overriding measures adopted by local governments, while 29 percent said they approve of the state doing that. The disapproval is stronger when Texans are asked about the Legislature overriding voters in local city and county elections: 56 percent oppose that and only 15 percent said they approve of it. "The response shows you the difference between overriding the institution versus overriding me and the people around me," said poll co-director Daron Shaw, a professor of government at UT-Austin. Democratic voters were against the state overrides whether the local laws came from governments or voters; in each case, a majority of Democrats were on the side of the locals. Republicans flipped, however, with 42 percent approving of overriding local governments and only 23 percent approving of overriding local voters. The University of Texas/Texas Tribune internet survey of 1,200 registered voters was conducted from Feb. 3 to Feb. 10 and has an overall margin of error of +/- 2.83 percentage points. Pollsters asked 593 Texans about overriding local governments and that response has an overall MOE of +/-4.02 percentage points. For the 604 respondents asked about overriding local voters, the overall MOE was +/-3.99 percentage points. Numbers in charts might not add up to 100 percent because of rounding. This is one of several stories on the latest University of Texas/Texas Tribune Poll. Monday: What Texans think of the new president, and their views on the economy and the direction of the country and state. Tuesday: Marijuana and other issues, health care and on immigration. Wednesday: Education. UT/TT Poll: How Texas voters rank the state Legislature’s priorities By Ross Ramsey February 23, 2017 Before they cut programs or services, lawmakers should dip into the state’s savings account, according to a plurality of Texans in the latest University of Texas/Texas Tribune Poll. The economic stabilization fund — better known as the Rainy Day Fund — has a balance of about $10 billion and is expected to grow by almost 20 percent over the next two years. Legislators have been slow to draw from that account, but if they’re faced with budget cuts, 43 percent of Texans think they should get into the fund, while 31 think they should not. Democrats feel strongly about it; 57 percent would hit savings, a position taken by 37 percent of non-Tea Party Republicans and only 30 percent of those who identify with the Tea Party. In contrast, 59 percent of the Tea Party Texans would leave that rainy day money alone, a position shared by 33 percent of Republicans and 19 percent of Democrats. Put another way, a majority of Democrats and a plurality of Republicans would use the fund to avoid budget cuts; a majority of the Tea Party identifiers would not. "They’re interested in cutting," said Jim Henson, co-director of the poll and head of the Texas Politics Project at the University of Texas at Austin. "If you give them something of a rationale for getting into the kitty for making ends meet, they don’t leap at it — but they don’t rule it out, either." The Democrats are the biggest of those three partisan groups in Texas; when respondents were asked whether they would vote for an unnamed congressional candidate from either the Democratic, the Republican or a formally organized Tea Party, 38 percent chose the Democrat, 24 percent chose the Republican and 15 percent chose Tea Party. The remaining 23 percent opted for “don’t know.” The Tea Party movement still has some clout: 21 percent of Texans said it has about the right amount of influence, 22 percent said it has too little and 31 percent said it has too much. 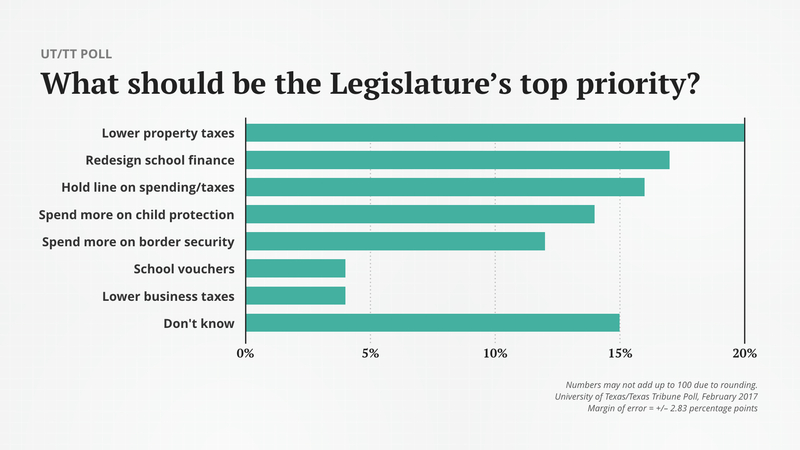 Legislative priorities Lowering property taxes was the overall top choice on a list of possible legislative priorities in the poll, getting 20 percent of all respondents and ranking first with Republicans and third with Democrats. Holding the line on spending and taxes was the second-ranking choice among Republicans, while Democrats’ top two — redesigning the state’s school funding system and spending more on child protective services — each were top choices for 23 percent of Democrats. Border security split the parties: 19 percent of Republicans said it was their top priority on the list, while only 4 percent of Democrats agreed. Emily Albracht Only one in four Texans has a generally accurate idea of the state’s budget outlook: 25 percent said the state has less money available to spend now than it did two years ago, which is correct. Another 12 percent said the state has more money available, and 18 percent said it’s got about the same amount available. The biggest group — 45 percent — said they “don’t know enough to say.” Later in the survey, Texans were asked how the state should respond to forecasts that it will have less money available over the next two years. Half of them said the state should make targeted cuts to specific programs and agencies. The rest of the answers were scattered, with 20 percent saying lawmakers should make across-the-board cuts to all state agencies and programs, 17 percent saying they should create new sources of revenue such as fees and taxes and 12 percent saying they should raise existing fees and taxes. Local control Pollsters asked about the state government overturning local laws and got two results, depending on who put the local laws in place. A plurality of 39 percent disapprove of the Legislature overriding measures adopted by local governments, while 29 percent said they approve of the state doing that. The disapproval is stronger when Texans are asked about the Legislature overriding voters in local city and county elections: 56 percent oppose that and only 15 percent said they approve of it. "The response shows you the difference between overriding the institution versus overriding me and the people around me," said poll co-director Daron Shaw, a professor of government at UT-Austin. Democratic voters were against the state overrides whether the local laws came from governments or voters; in each case, a majority of Democrats were on the side of the locals. Republicans flipped, however, with 42 percent approving of overriding local governments and only 23 percent approving of overriding local voters. The University of Texas/Texas Tribune internet survey of 1,200 registered voters was conducted from Feb. 3 to Feb. 10 and has an overall margin of error of +/- 2.83 percentage points. Pollsters asked 593 Texans about overriding local governments and that response has an overall MOE of +/-4.02 percentage points. For the 604 respondents asked about overriding local voters, the overall MOE was +/-3.99 percentage points. Numbers in charts might not add up to 100 percent because of rounding. This is one of several stories on the latest University of Texas/Texas Tribune Poll. Monday: What Texans think of the new president, and their views on the economy and the direction of the country and state. Tuesday: Marijuana and other issues, health care and on immigration. Wednesday: Education. Disclosure: The University of Texas at Austin has been a financial supporter of The Texas Tribune. A complete list of Tribune donors and sponsors can be viewed here. Reference UT/TT Poll, February 2017 - Summary (321.8 KB) DOWNLOAD Reference UT/TT Poll, February 2017 - Methodology (52.9 KB) DOWNLOAD Reference UT/TT Poll, February 2017 - Crosstabs (1.2 MB) DOWNLOAD "UT/TT Poll: How Texas voters rank the state Legislature’s priorities" was first published at by The Texas Tribune, a nonprofit, nonpartisan media organization that informs Texans — and engages with them — about public policy, politics, government and statewide issues. Link back to the original article, which is located at https://www.texastribune.org/2017/02/23/uttt-poll-how-texas-voters-rank-state-legislatures-priorities/.